Israel is permanently under the magnifying lenses of foreign journalists. Their main focus is on the Arab-Israeli conflict and on the politics that surrounds it. If only a small fraction of life in Israel would be reported, the public’s perception of reality would be different. What follows are a few vignettes that attempt to doing that. 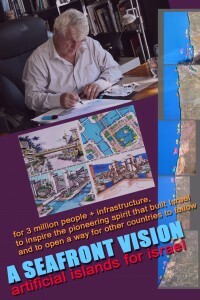 In September of 2012, Prof. Michael Burt from the Technion invited me to Haifa to start the process of producing a documentary on his vision of artificial islands along Israel’s Mediterranean coast. My flight from L.A. was scheduled for November 18. On November 14 Israel started “Operation Pillar of Defense”, following over 100 rockets fired from Gaza during the preceding 24 hours. War followed. 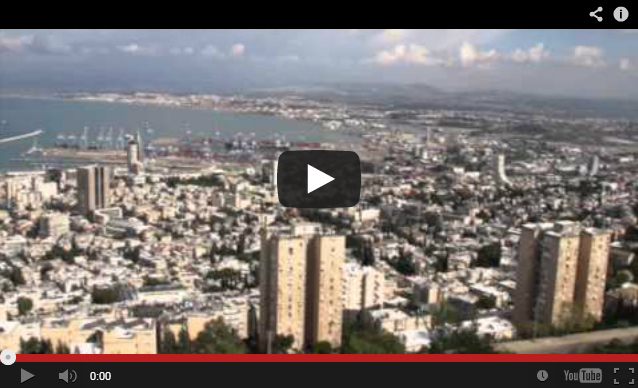 For the first time since the Golf War of 1990-91, air raid sirens sounded in Tel Aviv. “Are you sure you want to go;” “Be careful;” “Be safe,” was the tone of many emails received before my departure. During the short two days spent in Tel Aviv, my number one architectural target was the Design Museum in the City of Holon, which opened in 2010. 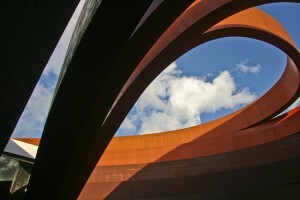 It was designed by London-based Israeli architect and industrial designer Ron Arad. The museum manages to be both rational and a daring piece of architecture. 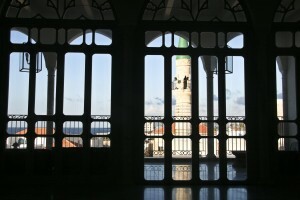 I was first surprise by its smallness, about 32,000 square feet (about 3,000 m2.) Although strikingly different than the surrounding environment, the ample space that exist between the museum, the surrounding buildings and the museum’s court engulfed by the bands, gives it a feeling of a large-scale sculpture at a human scale. The new Tel Aviv Museum of Art expansion designed by Preston Scott Cohen from the U.S., with Amit Nemlich from Israel as the project leader, is located in the heart of Tel Aviv, adjacent to the Tel Aviv Performing Arts Center (the New Israeli Opera and the Cameri Theater) and the Municipal Library. It is based on a triangular parcel. Built in pre-cast concrete and stone, it contains seven galleries pin-wheeled around a central space, each at a different level. Three of its five levels are underground. It adds 195,000 square feet (about 18,000 m2) to the existing main built in 1971. Its form allows for the maximum use of the volume. The Port of Tel Aviv is an area of cafés, pubs and other places of entertainment on the southern part of the Yarkon estuary, where the docks of a small port operated from 1938 to 1965 used to be located. After years of neglect, the area has been redeveloped into one of the “in” places of the city. It is a great space for people to walk, dine, people-watch or go fishing on the old pier. In the farmer’s market you can find all kinds of delicatessen and specialty foods. Part of the boardwalk has been laid out in gently curving surfaces resembling miniature sand dunes, where kids love to skateboard. Its restaurants, cafes, ice cream parlors and the fashion shops occupying the renovated old warehouses were filled to capacity as usual, with people having a good time. The Yarkon Park is “Tel Aviv’s Central Park.” It is an island of tranquility in the midst of the city. Located in the northern part of town, it is the place where Tel Avivians go to stretch out on the grass for a picnic or a nap in the shade, to jog and bike on one of its paths, to rowboat, and also to assist at a rock concert. My base was Haifa. From there I went to several locations to shoot. My preferred spot was Akko, which hits a deep cord in me. It has historic thickness: Greek, Roman, Crusade, Arab, Ottoman, British; it has human scale and social mix – 67% Jewish, 25% Muslim Arab and 8% a mix of Christian Arabs and other ethnical groups. When I was a student at the Technion, I used to drive there at least once a week for a good conversation while eating hummus, or just to draw, sitting on one of the Ottoman walls that Napoleon couldn’t conquer. The Carmel Tunnels are an extraordinary work of engineering and of urban design. The tunnels’ purpose was to reduce road congestion in the Haifa area and to provide an alternate route of reaching the eastern and central parts of the city, the Haifa Bay and the cities along the coastal plain. The tunnels cut the travel time from the Haifa South interchange in the west to the Checkpost interchange in the east from 30–50 minutes down to 6 minutes. Part of my assignment was “to document the future,” to foresee through Prof. Burt’s eyes a range of development that goes from the next few years to the end of the century, when the population of Israel is expected to be twenty million (today is eight million.) It is a future where multiple islands along the coast are built using an innovative technology that utilizes only 7% of materials to form the island’s volume. The vision includes urban development for three million people, an international airport, industries, resorts and a University of the Sea. Wonderful to see normal life, architecture and the flow of diverse cultures in different cities. I like the length of the video, just right — not too long but informational. I’ll watch more, too. Thanks!